While surfing Facebook, you come across a local senior market insurance agent's page and see that he or she got a couple dozen people to slap some stars down and write a pleasant sentence or two about him. "What’s so great about that," you ask? Facebook page reviews go beyond just twinkling stars and kind words: they provide valuable real estate that opens new doors, re-opens old ones and presents new business opportunities that weren't previously apparent. By neglecting the reviews section on your Facebook page, you're likely losing out on deals you could be winning. So, how exactly do you begin generating revenue from this valuable real estate? Read through this post to understand core ways that Facebook page reviews can benefit you. Be proactive in collecting Facebook page reviews by asking your clients to write them. Not only will this extra outreach [hopefully] add to your collection of positive reviews, but also serve as an excellent opportunity to reconnect with them. For example, let's say you were to contact a client asking for a review who you had previously sold a Medicare Advantage policy. The client could then inquire about a hospital indemnity product to compliment their existing MA policy. And BOOM - just like that, an existing client would bring in new business from your outreach. Think of your Facebook page reviews section as an archive of case studies available to you when brainstorming new marketing materials to promote your business, such as email campaigns, presentations or proposals. 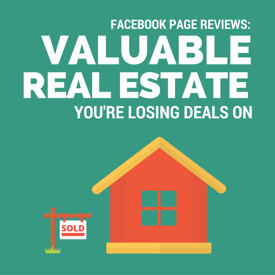 Use your Facebook page to your advantage by pointing prospects to reviews from clients facing challenges similar to their own. The larger your library, the better the odds. When a prospect stumbles upon your Facebook page, they are granted an opportunity to see what other senior clients may have to say about doing business with you. Encourage your clients to drop by your Facebook page and vocalize their opinion upon how you were an essential and influential resource in guiding them to select a plan that best-suits their healthcare needs. Not only does this build trust with prospective clients, but also relays social proof. While you may not have previously deemed Facebook page reviews as valuable assets in your sales process, hopefully these core examples show how they can be. Implement these practices, and you'll quickly begin winning deals you may have been previously losing. With all of the technology in this day and age, you probably wouldn’t need to be physically present to make a first impression. Go ahead - Google yourself. Did you stumble across your LinkedIn Profile as the first or second result? Me too. All thanks to LinkedIn’s SEO efforts, this means your prospective clients are getting to know some bits and pieces prior to even shaking your hand and looking into the whites of your eyes. Hence, it is more important than ever before that your LinkedIn Profile makes a positive first impression and a lasting one, at that. 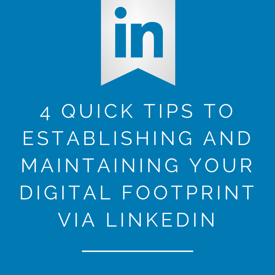 To help build out the most basic parts of your LinkedIn Profile, Precision Senior Marketing is here to share 4 quick tips to establishing and maintaining your digital footprint via LinkedIn. Take a peek! Your headshot is one of the most essential elements in establishing your LinkedIn profile. In fact, your profile is 14x more likely to be viewed by simply having a profile picture in-place and will encourage viewers to peep the rest of your profile. Instead of ending the conversation quickly by responding with a mere, "I’m an independent insurance agent,” you should go more in-depth concerning what you actually do. Think of your tagline as a mission statement - something along the lines of: “Educating the senior market to make informed decisions around their healthcare needs”. It is far more intriguing. Utilize the first paragraph of your LinkedIn Profile summary to provide a quick, high-level overview of the type of work you do - without all of the details. This is not the place for senior market insurance industry jargon. Following your value proposition, you have the chance to make a real connection with your prospects by showing your human side in the second paragraph. Write your LinkedIn Profile summary as you speak rather than in third person. Reflect and ask yourself, “What do my clients and I have in common?" Wrap up your LinkedIn Profile summary by making it easy for your connections to find your contact information by adding it to the closing paragraph. Your LinkedIn Profile will be much easier to share upon customizing your Public Profile URL. Instead of a default URL with a oodles of confusing numbers at the end, customize it to something with a nice and clean look, like this: http://www.linkedin.com/in/carolinekcallahan. Customize your LinkedIn Public Profile URL by clicking the gear icon to update your public profile settings beneath your profile photo. This will redirect you to your Public Profile page, where you may edit your URL on the left hand side. When utilizing these basic four tips, just remember to stay within your company’s compliance guidelines when making updates to your LinkedIn Profile. If you are an independent senior market insurance agent needing further direction upon establishing and maintaining your digital footprint via LinkedIn, feel free to give PSM's expert team of marketers a buzz at + 1 (800) 998-7715. The Centers for Medicare & Medicaid Services (CMS) announced Monday Medicare is expanding a major experiment in efforts to keep seniors healthy and prevent common problems that may often lead to hospitalization. Traditionally, Medicare pays your senior clients' bills as they come in from doctors and hospitals, but in 2016 the nation's flagship healthcare program is working to seek out better ways to balance cost, quality and accessibility by coordinating basic medical care. With Medicare’s long-term financial future in jeopardy, much is at stake. Hence, we've put together this handy, comprehensive blog to help you, as a senior market insurance professional, better understand what changes your senior clients can expect for Medicare in 2016! Accountable Care Organizations (ACOs) are networks of doctors and hospitals that collaborate in efforts to improve quality and lower costs for patients with chronic medical conditions. In hopes to redefine the way medical care is delivered to those patients, ACOs have taken a more hybrid approach — emphasizing teamwork among clinicians, timely preventive services and close attention to detail regarding patients’ transitions from hospital to home. In order to receive a portion of their payment from Medicare, ACOs are critiqued upon how well they meet those goals. Measurements may include [but are not limited to] coordinating regular follow-up visits for those patients with chronic medical conditions and making sure they're keeping up with their medications as prescribed, as well as eliminating duplicate tests. Patrick Conway, Medicare’s chief medical officer, said organizations that take more responsibility for the bottom line often do better on quality, because they have a greater incentive to keep patients healthy. Beginning in April, 2016, hospitals in 67 metro areas and communities will be held responsible for managing the total cost for Medicare beneficiaries' most commonly noted surgical procedure: hip and knee replacements. The experiment will cover a 90-day window — from initial doctor visit, on to surgery and later to rehabilitation. Medicare beneficiaries choosing hospice benefits toward the end of their lives have traditionally had to give up most remedial care. Under Medicare’s new Care Choices model, those terminally ill patients will be granted an opportunity to receive hospice services without giving up treatment. For example, a cancer patient could continue to get chemo. Beginning January 1, 2016, 70 hospices will start the experiment. Another 70 will join in two years. While Medicare’s overall goal is to improve quality while lowering cost, hospitals hold much worry concerning financial consequences and advocates for patients say there’s a potential to skimp on care. “What we are discovering with all this change is that trying to get to value over volume is very difficult to do,” said Missouri Hospital Association's head, Herb Kuhn. Our friends at InsuranceNewsNet recently conducted a poll to find just what, exactly, the profiles of success in the insurance industry look like. While most of their readers reported to sell products traditionally associated with insurance, many of the top tier-earning producers tended to have practices that are slightly more hybrid. Lucky for you, Precision Senior Marketing has leveraged the data from INN to give our agents four quick tips to help you get closer to becoming a senior market insurance top earner in 2016. While many of the lower earners reported having worked out of their home and as a lone employee in their practice, the poll results show that working in an office with at least two to five people rather than from home and alone is a common trend among the top dogs. This one goes without saying, but I'll say it anyway to emphasize: Spending enough time in your work and career is crucial to becoming a top earner in the senior market insurance industry. So, burn that midnight oil and put in 40+ hours per week! While many, if not all, readers reported a vast majority of their business to have derived from referrals, we could not stress enough how important it is to keep in touch with your current clients. With 55% of online users age 65 and over using Facebook in 2014, it is essential for you to create a Facebook Page to service and retain those existing clients. The smallest of interactions, like dropping by a client’s Facebook to post a comment celebrating another rotation around the sun, helps emphasize your appreciation for their business. Not only will your Facebook Page improve the overall client experience, but also serve as a solid foundation for prospects to gain insight toward your role as a senior market insurance specialist. If social media isn't your thing, be sure to send out a birthday card to your clients and give them a ring every once in a while. Other ways that the top earners generate new business include forming strategic alliances with attorneys, CPAs or other financial professionals. Think outside of the box! While the poll results show that you can expect to hold your insurance license for about 10 years before hitting the $100k mark, there are measures you can take to help get you there at a significantly faster rate. For example, you could diversify your portfolio by adding an array of life insurance products such as term, universal, whole from the senior market insurance industry's leading carriers. Annuities wouldn't be a bad idea, either. If you haven't already considered this option for the near future, you might want to look into attaining your Series 6 license, which allows you to sell variable products, like variable annuities, variable universal life insurance and variable life insurance. According to the poll results from top earners, it's also safe to say that it certainly helps to obtain at least a few designations (i.e. Life Underwriter Training Council Fellow or Chartered Life Underwriter). Many of the top earners in the poll reported high involvement with industry groups. So, join NAIFA and get out there! Network with colleagues who face similar challenges as you. See what they have to say. It's also advantageous of you, as a senior market insurance specialist, to hold informational seminars. This will not only help with prospecting, but will also assist in displaying your genuine care and concern for educating the senior market.